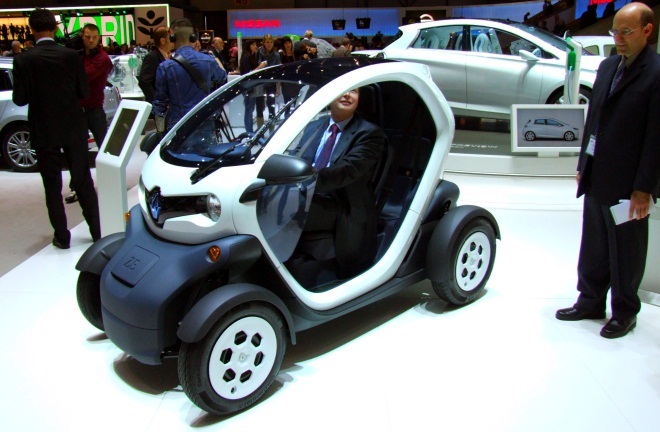 Renault is showing off a couple of examples of its innovative Twizy electric mobility pod at the Geneva Motor Show. Changes since the production version was first unveiled in Paris last year are minor: it has sprouted sleeker door mirrors, for example. The more major difference was the appearance of two versions dubbed Urban and Technic, with the Urban edition noticeably lacking in the door department. 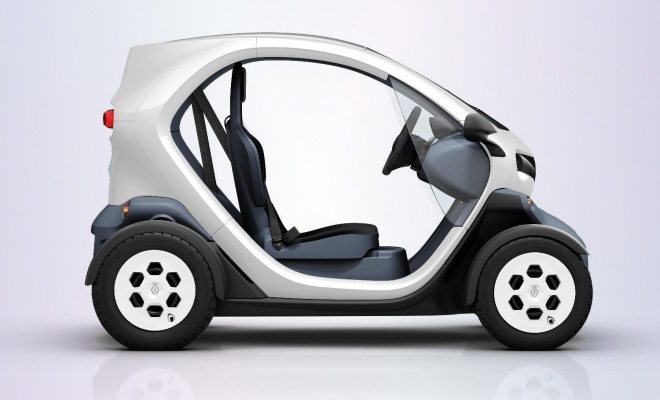 To date, Twizy has always sported some sort of lateral barrier, from the fairground-ride safety bars of the original, hexagon-wheeled concept to the scissor-action, perspex-panelled half-hatches seen in Paris. Now we know even these vestigial items are optional. Presumably the naked, doorless Twizy is the low-powered version. Renault plans to sell a 4kW (5.4bhp) edition in markets where pimply youths are let loose on the roads in microcars, alongside the 15kW (20bhp) edition aimed at grownups and more restricted markets such as the UK. I might be wrong, though. Maybe the Urban version is just the base trim level. The teenagers’ Twizy won’t exceed 45km/h (28mph) whereas the faster model will hit 80km/h (50mph), which will probably feel plenty fast enough. If you do opt for a Twizy with doors, don’t imagine they will keep out the elements. There are no windows, and there are no rubber seals to keep puddles at bay. Instead, there’s an optional apron – as seen decorating countless continental scooters – to keep out the worst of the water. And of course you can wear a coat. And maybe a hat. The lower powered 4kW Twizy offers the same 100km (62-mile) range as the full-fat 15kW edition, as well as the same 3.5-hour recharging time and the same 57Nm torque rating, so it seems safe to assume that the power limit is purely a software tweak. No doubt there will be a thriving online market in hacked firmware once tech-savvy youths are let loose on the thing. I haven’t yet driven a Twizy, but climbing aboard the static example at Geneva revealed a comfortable cabin furnished in hard plastics, with great vision and a fair bit of headroom. The seatback doesn’t adjust for rake, due to its duties as seatbelt anchor, but the pew can be moved forward and back for legroom by means of a simple lever in the seat base and a heave of the knees. Surprisingly, for a vehicle open to the elements, the airbagged steering wheel is leather trimmed. Seat fabrics, by contrast, look reassuringly waterproof – according to Renault the car can be jet-washed inside and out. The cabin is not quite so comfortable in the back. Access is awkward and there’s not a great deal of room. Renault will sell you a 50-litre bag designed to fit on the rear seat, and it at least won’t complain that there’s nowhere to put its legs. There’s also a 60-litre storage cubby under the rear seat base. Controls appear extremely simple. 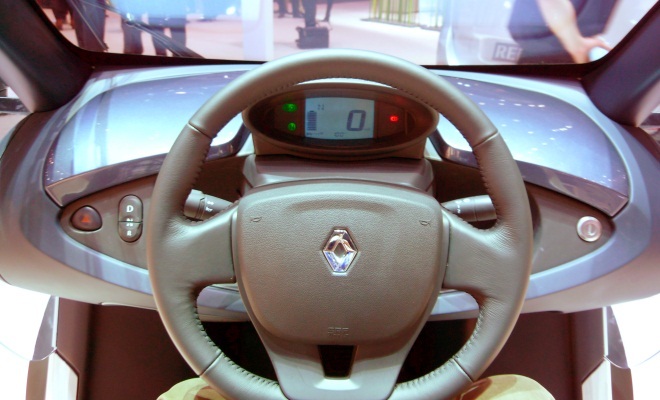 The dashboard offers an ignition slot, hazard flasher switch, and a two-button forward, reverse and neutral controller (press both together for neutral). And that would seem to be it. You bring your own stereo, plugging in via USB, audio jack or iPod connector in one of the two gloveboxes. UK costs and availability remain to be confirmed, but euro prices will start from €6,990 (£5,995) plus €45 (£39) per month battery rental when the Twizy goes on sale towards the end of this year. Classed as a quadricycle rather than a car, the Twizy will not be eligible for the government’s Plug-in Car grant in the UK. So you’ll have to pay for the whole thing yourself. 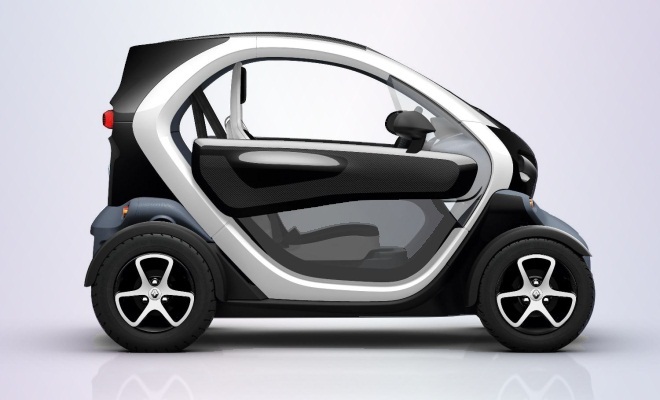 I do hope to drive the Twizy later this year, but for the moment, I remain convinced that the Twizy will be an iPhone-like sensation. Or possibly a Segway-style flop. One or the other - I doubt there will be much of a middle ground for a product as revolutionary as this one.